With the Summer holidays on the way, your children will be away from school and looking for something to do in the warm weather. Getting out in the garden is a great time for playing and being at one with nature. Your garden will need to be both safe and practical for your children, as well as fun! 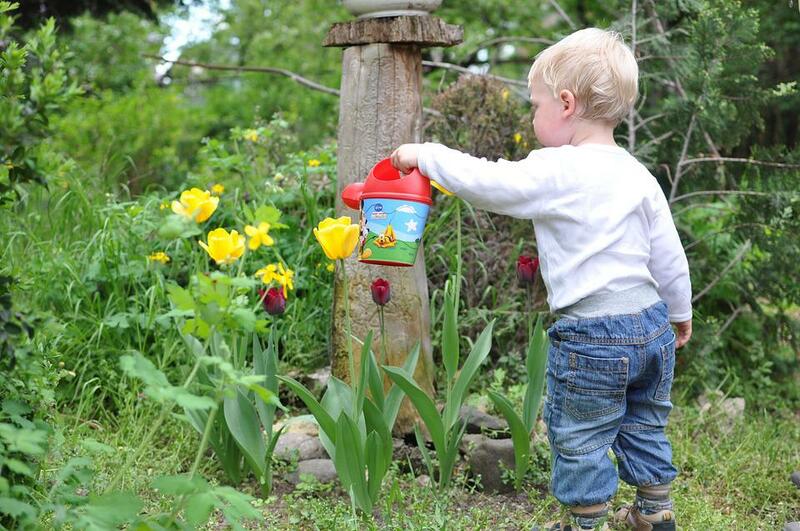 Here are some useful ideas for making your garden a child friendly place. If your children are old enough to play safely outside without you constantly looking over their shoulders, the area needs to be safe. You are probably going to have a few scuffed knees over the holiday season, so you don’t need to wrap your children up in cotton wool. However, there are simple ways you can make your garden a safe place to be. Secure the fence and gates. Especially if you have very young children, you don’t want them squeezing through gaps in the fence or getting out of an unlocked gate. Especially if you live in a well populated area. Be aware of any water you have in your garden, from a trough to a pond. Children can drown in only a few inches of water, so if you do have a pond buy barriers to prevent them from falling in. If your kids have play equipment outside, ensure you have soft landing mats beneath. Grass may be soft to touch, but is harder to land on after a fall. Every garden needs a few plants scattered around, but some can be toxic to both touch and taste. When you buy new plants they are often labelled for safety, so take heed of any warnings. Not all berries are safe either, so remove any from bushes to avoid your children having a nibble. Being outdoors is educational for any child and while there are things you don’t want them to touch, there’s no harm in them exploring the wildlife and plant life within. They may get mucky but that’s all part of the fun for kids, so let them discover the wonders a garden can bring. You can create great bonding opportunities with your children when you spend time in the garden together. You can teach them valuable lessons about nature and wildlife, whilst having fun doing it. For example, growing your own fruit and vegetables can be a wonderful shared experience. Whatever the size of your garden, make a plot, where you and your children can plant seeds and watch them grow together. Children are notoriously fussy eaters so it may make the greens on their plate more exciting to eat, if they’ve spent time growing them. If you have a small garden, 4×4 greenhouses are a great place to grow tropical fruits such as apricots, peaches, and nectarines. Whatever you do this summer, make it a memorable and fun time for all of you!